Greetings from the Team at 3dSaraCreations.com! IMPORTANT: All files included in these project packages are free to use in personal and commercial renders but may not be distributed, sold or shared in any way. If you create add-ons to these models (textures, morphs, etc. ), you can't sell them but you can offer them as freebies. Our aim is to keep Sara FREE. 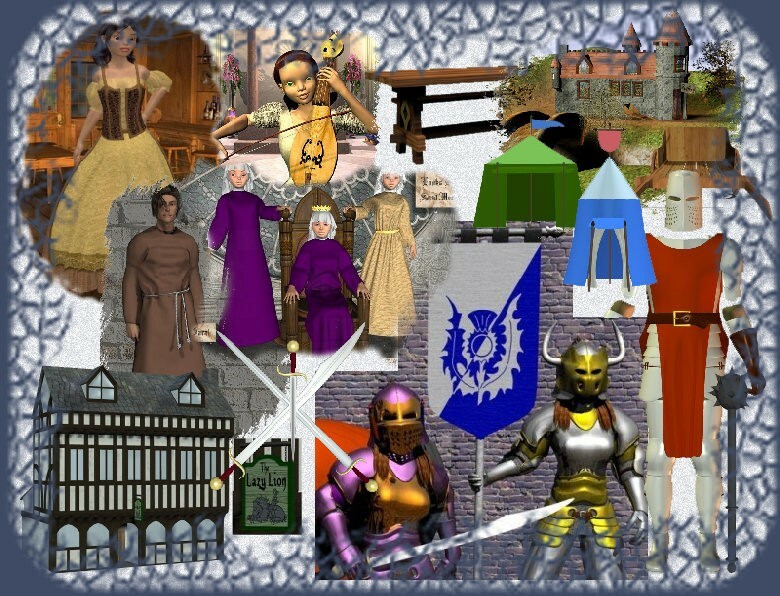 Everything for your castle: Banners, furniture, dishes, etc. This is the last 3dSC project. 3dSC is now closed. Downloads will remain available for as long as we have a host for them. For the moment, Jeff Alberts is hosting them and we thank him wholeheartedly for it! We'd like to thank everyone who, at one time or another, has been part of 3dSC Team and has worked hard on creating beautiful freebies for Sara. Each zipfile include a list of its content. This list will be found in 3dSC Readmes folder OUTSIDE your Runtime folder.